A guest speaker who frequented my nutrition course at the University of Colorado often spoke of the importance of maintaining a diet that did not consist of foods with a high acid content. Her reasoning was that these types of foods throw off the body’s ph, setting the stage for cancer and a host of other chronic diseases. Foods that she mentioned seem to constitute the Standard American (SAD), foods that are processed, rather than natural (e.g., plucked off a tree or pulled out of the ground). I once heard Andy Weil, M.D. speak on the topic of nutrition where he was asked the question regarding acid-based foods and their effects on one’s health. He said that the body’s requirement for a “perfectly balanced” ph is so vital to one’s health that if it were the slightest bit off, all hell would break loose in the body (e.g., immanent death). He dismissed the idea of foods that are acidic in nature because the body will rectify this in the digestion process. Fair enough, but what if the preponderance of cancer and all the other chronic diseases are the result of the body’s ph being just a hair off every now and then… enough to set the stage for illness? It is a well known fact that stress greatly compromised the digestive process. In the bigger picture, might not a poor diet and a compromised digestive tract be a bad combination for health? Medical experts tend to be specialists in one area, such as cancer, without looking at the big picture. It is a travesty that most physicians have little or no background in nutrition whatsoever. The bottom line is that balance is crucial to one’s health; so is a healthy diet. Is there a fair amount of processed foods in your diet? If so, your diet may be high in acidic foods rather than a balance between acidic and alkaline foods. All things being equal, your digestion process should neutralize the foods you eat. Yet with acid reflux being such a problem to day, and Americans drinking ungodly amounts of coffee, (not to mention a host of other processed foods consumed) perhaps eating a diet that is high in fresh fruits and vegetables is a good idea. So today, snack on a fresh apple, reach for some carrot sticks and drink water or iced tea rather than soda or coffee today, perhaps the whole week. Consider putting a slice of lemon in your drinking water too. Balance is the key to life! 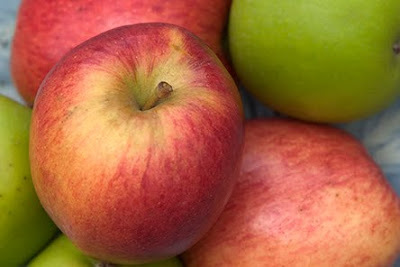 Apples are definitely in season right now (my favorite are McIntosh Apples, which has nothing to do with my favorite laptop computer). Here is a photo from the Seaward nutrition collection. Enjoy!